Truly a UNIQUE find in Charleston!!! Perfect pied a terre. 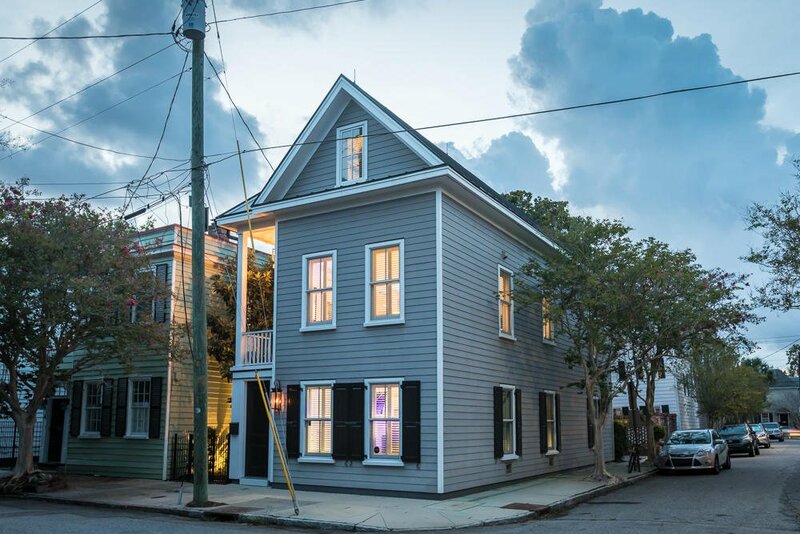 Newer construction with the exterior charm of a 1870's down town home. Absolutely gorgeous and state of the art! Hard wood floors through out. Open concept floor plan. Balcony off the great room. Complete modern kitchen with elegant SieMatic design, concrete counters, stainless steel hood and Miele stove top. Custom pendant lighting over the kitchen island. Recessed lighting with dimmer switches through out. Master bedroom is downstairs with floor to ceiling tiled shower and radiant heated floors. Upstairs is a huge area with full bath and closet that is currently used as a work out studio but can easily be converted to 2nd bedroom. Copper roof, down spouts, and flashings add to the charm. Gas lanterns adorn the front entrance. Cat 5 wiring with speakers. Lightning suppression system. Security system. Air conditioned three car garage, and yard lighting are just some of the many upgrades in this home. Additional 3 car off street parking as well as permitted street parking. Absolutely must see! Perfect combination of the modern lifestyle with the old look of Charleston.